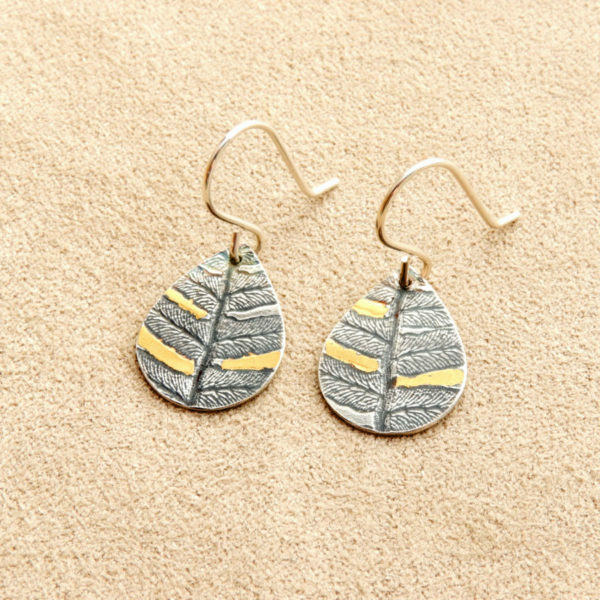 These earrings feature detailed and intricate impressions of bracken fern fronds. 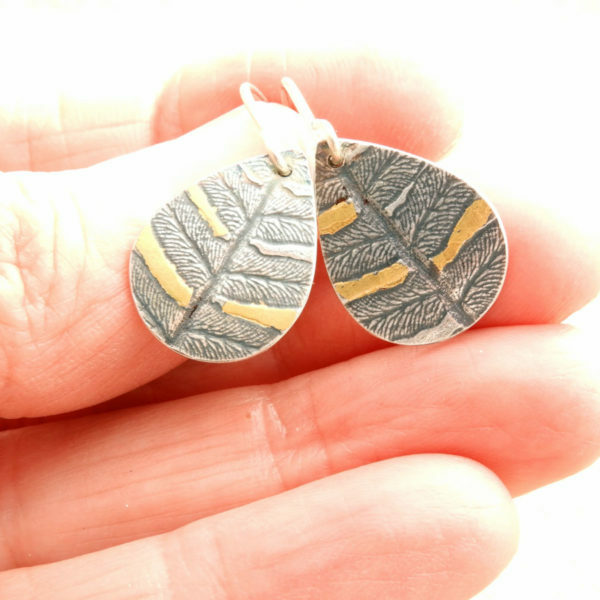 Each earring is unique because the fern snippet is used only once in the roller printing process. After creating the impression in the silver, each earring is cut out to a wide tear drop shape using a hand saw and the sides sanded smooth. Using a Korean technique known as “keum boo” (translation: attached gold), pieces of 23K gold sheet are fused to the silver. The final step is a patina that darkens the recesses in the silver but does not affect the gold, and results in a lovely contrast between the metals. 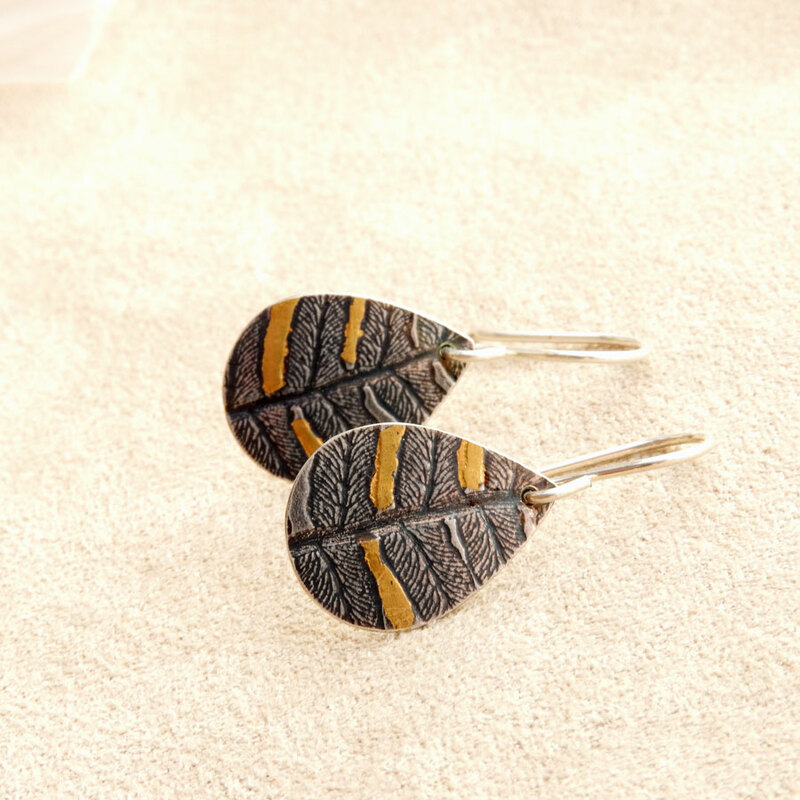 The earrings are sturdy but light and feature sterling silver ear wires. Dimensions: The leaves measure just over 1/2 inch in width at the widest point and hang 1 and 1/8 inches, measured from where the earring inserts into your ear. Exact patterns will vary with each earring. This is a lovely, unique earring for all of you lovers of nature. Your earrings arrive in a sturdy gift box with a story card listing all components. Shipping is free.